Winter can be a dull time to visit a vineyard, especially if you have visions of leafy canopies heavy with fruit dancing in your head. 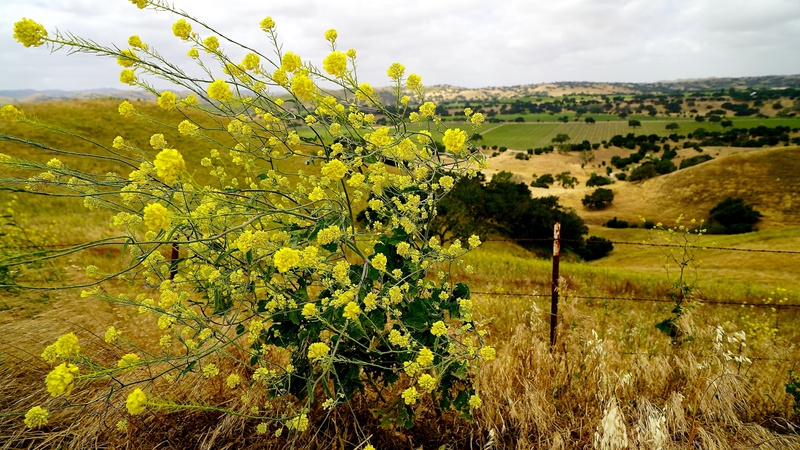 However, in many parts of the wine making world—including the well-trod regions of Napa, Sonoma, and Burgundy—winter brings its own measure of delight in the form of a waving sea of yellow-gold blossoms: the dance of the mustard flowers. Mustard and wine share an affinity on many levels—there is the delight of grilled chicken in mustard cream sauce paired with a crisp Chardonnay, for example—and the flagship of all mustards (Dijon, of course) is made with wine. The plants themselves—the mustard flowers and the grapevines—get along famously as well. 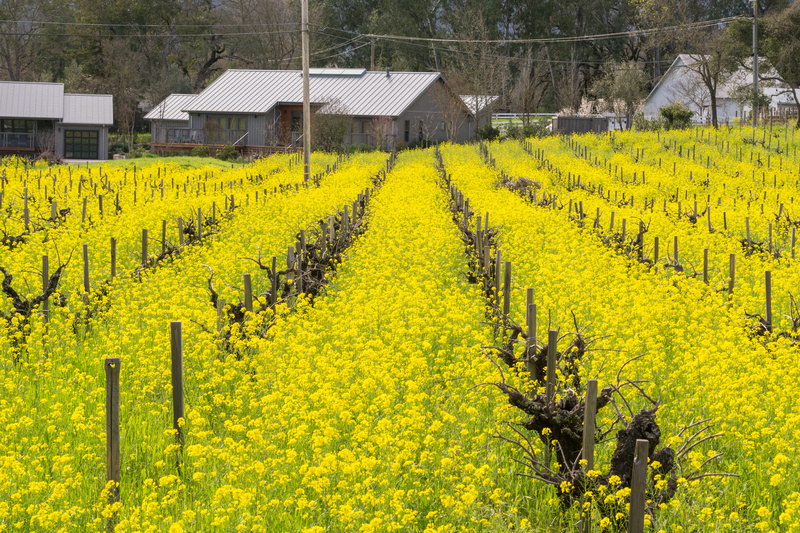 The vine: When used as a cover crop between rows of vines, mustard plants can provide the benefits of any cover crop such as protecting the soil from erosion, improving the ability of water to penetrate the soil, attracting beneficial insects, and increasing the organic matter in the soil. 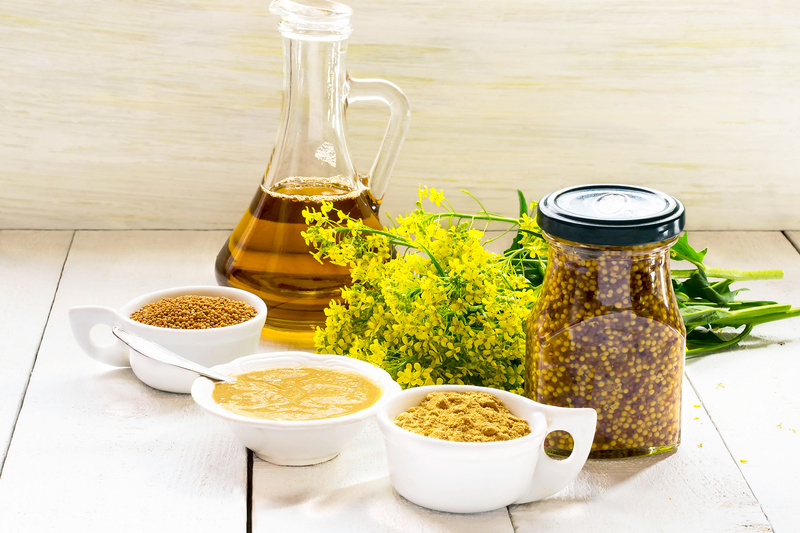 Mustard plants have a few specific benefits as well. For one, they are very hardy—the seeds of the mustard plant can survive in the soil for up to 40 years, and spring to life after a late fall rain. Mustard plants also produce biofumigants (natural chemical agents) that suppress nematode (nasty little roundworm) populations. The plant also recycles and redistributes nitrogen in the soil, making it more accessible to the vines. The mustard: About that famous mustard from Dijon…I was fascinated to learn that “Dijon Mustard” is not a legally protected name, nor an approved designation of origin. It seems that mustard from Dijon had been so widely used—and imitated, in the highest form of flattery—that by the time a geographical indication for Dijon was suggested (in 1937), it was determined that the term was being used for products made in Dijon as well as products made in the style of mustard made in Dijon. As such, the term had already entered into the lexicon as a generic term, and therefore there could be no protection for “Dijon Mustard.” This makes sense currently, as the last of the Dijon mustard manufacturers left the city of Dijon about ten years ago—and even then they were using some mustard seeds from Canada alongside those that were locally-grown. However…there are plenty of mustard plants and lots of mustard production in the region of Burgundy surrounding the city of Dijon. There is even a Protected Geographical Indication (PGI) for Moutarde de Bourgogne (Burgundy Mustard). 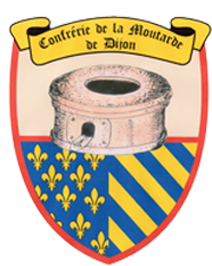 The PGI was granted in 2008, but the Brotherhood of the Moutardiers-Vinaigriers of Bourgogne (Héritière de la Confrérie des Moutardiers-Vinaigriers), originally founded in Dijon, dates back to 1600. If you’d like to try the legendary Burgundy mustard and Burgundy white wine pairing for yourself, I suggest this delectable Mustard Roasted Chicken recipe from the Barefoot Contessa, which I would pair with a nice, casual white Burgundy such as a Saint-Véran, Pouilly-Fuissé, or white Beaujolais. I do recommend you sub-out the suggested Grey Poupon for an authentic Moutarde de Bourgogne (shhhh….don’t tell Ina).